How can you tell when the times are changing and great progress is being made, or when we instead appear to be going back in time – ‘going back to “79”’ – as the lyrics of a recent tribute to David Cameron’s UK government suggested? Often it feels as if it was mostly in the past that great steps forward were taken. However, it was probably the case that at those times people did not realise that they were achieving much. The same may be true today. As levels of economic inequality reach new heights and unemployment rises – and does so most in those countries that still pay enough benefit to make claiming a temporary option for enough people – you might think that tolerance of difference would fall. But this is not necessarily so. In some of the most unequal of rich countries, such as the UK and the US, benefit levels are now so low, when compared to average wages, that people will do almost any job, or more than one job, to avoid having to claim the new, very low, dole. Surely in this environment many will become increasing intolerant of others – people from different groups who could be taking ‘their’ jobs? What I think the graph above shows is that some things change slowly and steadily in a way that is almost impervious to immediate events. However, there is another way to look at Krugman’s data. Instead of just plotting the % approval rate, take each proportion and calculate a ratio from it, either of disapproval when that is in the majority view, or of approval when that is most popular. 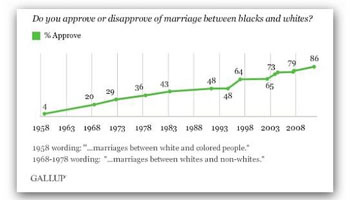 In the late 1950s, 24 people disapproved of mixed-race marriage for every one who approved [24 is 96 (100-4) divided by 4]. 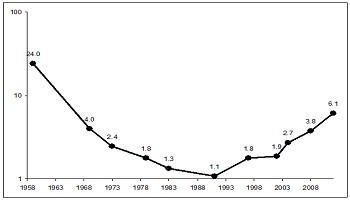 By the late 1960s, that ratio had plummeted to 4, calculated as 80 divided by 20. By 2012 the approval ratio had reached 6.1: some 86% of people approve and 14% do not (6.1=86/14). The redrawn graph below shows all these ratios. It is drawn using a log scale. When you look at the graph above and compare it to Krugman’s original, you don’t see slow and steady progress, but rapid, then slow, and perhaps now rapid progress again. The graph above shows that attitudes can become radically more tolerant even as inequality and poverty both rise. Intolerance in the US last fell so fast when the 1960s ‘war on poverty’ was at its height, when the level of income and wealth inequality in the US reached historic minima and when the National Guard was sent into the deep South to prevent lynching. The rise in tolerance faltered during recent years of Republican dominance, but has shot up again under Democrat Party Presidential tenure. We might well look back in future at the years just before and after the 2008 economic crash and say – that was when the tide of social change began to accelerate in the US. If my analysis of the figures above is right, the tide may also be changing not just in relation to tolerance of mixed-race marriages, with what that implies for racism diminishing, but perhaps also in much more that currently does not look encouraging in contemporary data. The lesson is simple: it matters how we draw our graphs and think about the numbers represented in them.